This doesn't mean we can't maintain our awareness for our ultimate customer - the end user. 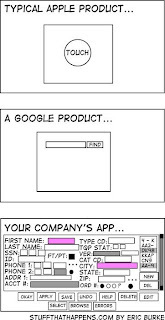 Tom Kyte recently linked to a cartoon that painted 1000 words about the way we write applications. (Thanks Eric Burke.) We've all been on projects where screens look like this, and considering we write GUI applications for databases that contain structures like this, it's an interface that's inevitable. The same reason the 747 cockpit contains 1000+ knobs and switches. However, we can still look for opportunities to simplify. The interface to Apple's iPod - iTunes isn't exactly a dummy user's delight. There are plenty of options and interface difficulties. They've just transferred the complexity away from the entry point for 90% of the music player's use. So what about your application. Are there points of entry that result in a large percentage of use? Is there a way to simplify the entry of key units of data? To go even more granular, are there little smarts you can add to certain types of fields, such as dates? Are there ways to minimise use of the mouse at all times? Is the first key field of your entry form user/time/context aware? Many considerations to make. I read a lot of blogs, and I admit many of them are certainly from a technical perspective on the database, but there are a few I subscribe to that aren't even software related - but still pertain to my job. In the same way that Microsoft employ psychologists to assist with the design of the menu structure and interfaces to their ubiquitous applications such as Word & Excel, I read some blogs that encourage thinking outside the square. One such article I came across recently was from Seth Godin - The End of Dumb Software. I can't remember where I first stumbled across his blog, but he always has interesting perspectives as a marketer that I can either apply within my job as a database developer, or even utilise in day to day life. He was having a gripe in particular about simple calendar applications. If 2 o'clock was selected, you'd have to presume 999 times out of 1000 that 2pm would be requested. So why is that not the default? Why can't a calendar application presume most dates used are within working hours, with the option to change if required. He goes on to suggest he shouldn't need to "edit" an event to view further details, though I understand the architect's potential thinking in that scenario. There are plenty of other quick examples he runs through that I think all developers, architects, designers should read through and consider. How many LOVs, search windows, entry points of various kinds have you created that could have been written slightly differently to save the end user some time & frustration? A simple example I can think of in a forms application I once worked on was the ability to enter the letter "t" in a date field to represent (and be automatically translated into on when-item-validated) today's date. How many times in your application may the user want to enter today's date? Turning it into 1 keystroke has saved between 5 and 10 keystrokes, depending on date format settings (310809 to 31-AUG-2009). One keystroke vs eleven? I know what I'd prefer. If you have other blogs in your RSS feed like Seth Godin, I'd be interested to hear about them. Many years ago when I was first learning Oracle (in the deep end) I came by the problem of data densification. I can't remember how I solved the problem back then, but I've encountered it a few times since. When writing my presentation for the model clause, I explored the difference between two options. Recently whilst investigating syntax definitions for the ANSI standard outer joins, I encountered another solution called a partitioned outer join - so I thought I'd compare all three for performance and readability. The scenario is thus - I have an amount in a table for various dates throughout the year, for a particular person. However in my report I wish all months of the year displayed for the person, regardless of whether amounts exist. Let's add a cumulative figure in there for good measure. Included below this is the SQL for my test case. This is a pre-10g solution, using an efficient method on the DUAL table to conjure records. I also use analytics to determine the cumulative amount. There is however a cartesion join and two full table scans on the customer table. Here is what some would consider a more elegant solution using the model clause. The explain plan is far neater, and the performance was also enhanced - and there was no joins & half as many logical reads. The cumulative column was calculated using a nifty rule computation. The following solution is the one I stumbled upon while playing with ANSI joins. I wanted to see how it compared with the others. We still have a join, but that's not necessarily an issue. It's certainly tidier looking than the first solution, and we don't need to fry our brain learn how to use model. I have heard some resistance to ANSI syntax however - not for the sake of going against the grain, but apparently there have been some security issues. I'm not qualified to comment on this, let's just compare the performance in this particular test case. Personally I was a little surprised at the dramatic timing difference with the partitioned outer join over the original. I thought perhaps that would have been more comparable to the model clause solution. Something to bear in mind in future development. If I needed to write this for a future project I'd probably take a closer look at the relevant data set using Tom Kyte's runstats package. This used to be located here - htpp://asktom.oracle.com/tkyte/runstats.html, but the link is currently broken. Possibly related to his recent move. However here is one of many of his forum entries addressing runstats. This package is better than just measuring throughput, it will let you know how your application may scale by paying attention to latches. A DBA's perspective can be found here. There are also abundant single row functions that are available, and some of them are easy to use, but sometimes no apparent usage immediately stands out. I make it no secret that my favourite online reference manual is the Oracle Database SQL Reference. I have a shortcut to a local version in my browser toolbar. Personally I prefer the 10g layout to the 11g one, but beggars can't be choosers I suppose. I thoroughly recommend beginners and even the more mature programmers to peruse this manual, in particular the chapter on SQL Functions. I believe awareness is often the key to writing a successful application - or at least not re-inventing the wheel. So to stop beating around the bush, what about the NULL-related functions, specifically NULLIF. Have you used it? The manual illustrates an example showing those employees whose job has changed since they were hired. If their job hasn't changed, then null is shown. A similar situation applies to a mailing/delivery/home address (albeit ideally on a separate table) or a work/mobile/home number, but in this case the COALESCE function is more appropriate. I plan a blog entry on this function in the near future, along with performance considerations. We can do this to return null where price is 0 instead of an error. Every time a new version is release I feel compelled to have a little peak at the definition of ALL_VIEWS, to see if columns such as ALL_VIEWS.TEXT have been converted from the LONG datatype. Alas, 11gR2 still has this utilises the LONG datatype, perhaps this is just something that has to be persistent through the ages. However we can still get around the issue. The reason I find this of interest is sometimes during an impact analysis of say - dropping a column from a table, we need to determine what objects refer to this column. We could start with ALL_DEPENDENCIES, but this isn't granular enough for some analyses. Here is my posting from April 2012 on using XML to solve the problem. Thanks for a tip-off from volleyball coach / Oracle guru Connor McDonald (and later by colleague Chris Muir), it seems 11gR2 was released while I was 30000ft in the sky. I wouldn't be practising what I preach if I didn't point you to one of the best books in the online Oracle Documentation - the New Features Guide. If you want to keep up with Oracle Technology, and learn a thing or two, every time a new version of Oracle is release, I highly recommend a peruse through this book. Keep a lookout in the blog community because plenty of articles pop-up around these times showing off the shiny new features. One feature I'll mention today is an extension to triggers. In a recent presentation I included some thoughts on compound triggers and a quick note on the FOLLOWS clause, allowing you to indicate that a trigger fire after a specified trigger. This can be useful if you need to extend proprietary Oracle software. I don't know whether it was an afterthought or this was just one of the last features installed in 11gR1 at the pleading request of a client, but it was a little odd that a PRECEDES type functionality wasn't included. However now in 11gR2, this is now available. There are caveats however, and in this case PRECEDES may only be applied to a reverse cross edition trigger - this is also a whole new ball game and I can't yet confidently tell you more about editions, except that Connor's been excited about the prospect of these for quite some time & it's impact throughout the database seems widespread.